Monte Carlo Weekly Photo: Time to Wake Up! 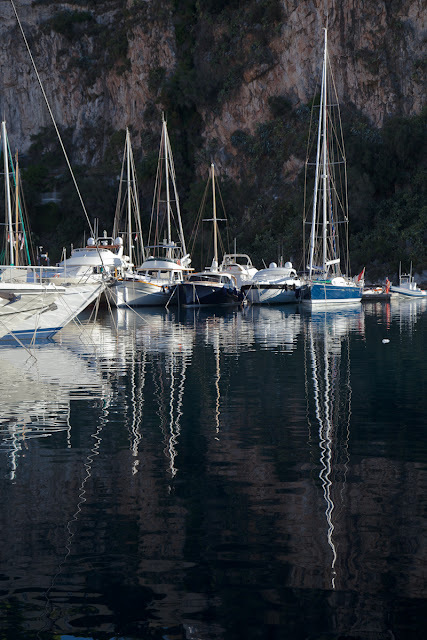 Early morning in Fontvieille harbour. These boats are tucked up against the rocks of 'le rocher' and about to wake up for the day. Way up above them is the Palace, the Oceanographic Museum and the Cathedral. The light is incredible, Jilly - and the reflections are so beautiful. Great shot! When I was in high school in St. Louis, I was in Sea Scouts and we would go on sailing trips up the Mississippi River, sleeping on boats smaller than these. I have woken up on boats like these, not just looking at them after waking up.